Wind, rain and … “warm”? The wind finally died down for a short while Wednesday. Then the temperatures dropped — again — and the rains came. then it cleared up and the winds howled from the north. Even the fish can’t give you a good fishing report. I tried to call Al Gore, the world’s foremost scientist on Global Warming, but he didn’t return my calls. I was able to get in touch with one of our area scientists, who did help clear up this Global Warming thing. He tells me it isn’t that complicated. Thermometers were only invented 290 years ago and it was probably only half that time anybody took any real measurements. Considering the age of the earth, that isn’t statistically significant to reach any kind of definitive conclusion, even by the man who invented the internet. So, I guess we can relax. It really is as cold outside today as it seems. That’s why I’m writing about it. It’s kind of fishy! Back to the wind. They don’t keep records for numbers of days of being constantly pounded by two to four feet waves at Eagle Point, but if they did, I think we just set it. The last five or six days – and nights – it hasn’t calmed down long enough for a turtle to stick its head up without getting smacked in the shell by a whitecap. 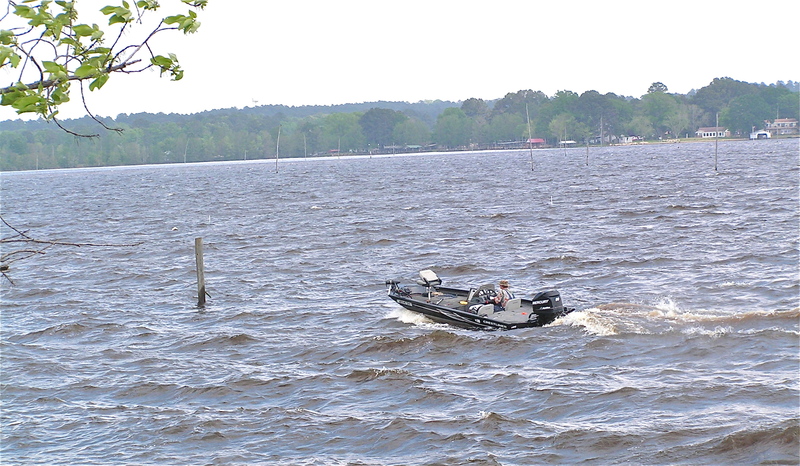 It’s made fishing dang near impossible on the east/southeast side of the lake, much less launching a boat. Thank goodness on the ‘Bone there are ramps that let you put in in almost any wind direction. There’s more joy the last few days. The rain and heat also brought on the first hatch of summer bugs and the wind blew them all over here, thank you very much. It’s even been too windy to go spray them so they won’t come rushing in when the garage door is open. Small price to pay for life on the lake, though. And now it looks like patience worked better than bug spray. The cold night got ’em! you should have said a LEADING area scientist.